← The Sports Archives – The Guide To Getting Better At Tennis When You Hit A Plateau! In the 1970’s the martial arts scene exploded due to the rise of martial art style films that were seen in both the movies and TV. Martial artists turned actors such as Bruce Lee and Chuck Norris became household names after starring in action packed movies where they displayed a dazzling display of kicks and punches which always helped them to defeat the bad guy. Not long after the initial explosion of these films a martial arts school or club could suddenly be found in almost every city and quite often in most strip malls in any given city block. The martial arts industry was growing as well as those that seek to capitalize on the opportunities now available. With the explosion in schools came an explosion in black belts, which usually symbolizes a person that has mastered their chosen art or could be considered an “expert” who should be able to sufficiently defend themselves against an attacker, much like their hero’s did in the movies. One very common practice has been the awarding of the coveted black belts to children who are often not even teenagers yet. Should Children Get Black Belts? My opinion is that children should not be awarded blacks belts prior to a specified age. It is clear that some children are very gifted emotionally as well as physically and they have the ability to quickly outshine their peers. These kids may master many of the movements and forms and look to the naked eye like an expert practitioner. The issue is that most children have not stopped developing and strengths they may have had at one point in time, such as flexibility, might become a weakness just a few years later. Mentally children are not finished growing either, martial artists are supposed to display knowledge, respect, dedication and perseverance. Can a child lead a class and give clear instructions and answer questions or effectively correct techniques of not just his or her peers but of those older than them? By giving a child a black belt it on occasion may give that child a false sense of confidence. Can an eight year old black belt be able to defend himself against a 14-year-old effectively? Many martial arts systems have governing bodies that try to assure the integrity of the arts and in order to fulfill that mission they usually have a pretty strict set of rules that must be adhered to by the students and instructors. While many of these governing bodies don’t allow black belts be awarded to kids under a certain age, many others do. In fact some of the schools that forbid a “dan” grade for children get around the rule by calling it a junior black belt or some other name but technically not awarding them a “dan” which for adults is exactly what a black belt signifies. For most of us when someone earns a black belt it is a representation of hard work, talent, dedication and respect. While many children can show these traits the black belt is also assumed to demonstrate wisdom, knowledge, skill, self-defense ability and toughness as well. These are traits that are harder to come by for a child that cannot hope to defend themselves against a small adult with no training, let alone one that has even marginal fighting skills. While an adult may see a tot running around the local grocery store with a black belt around their waist it is important to remember that it is not the fault of the child but rather the fault of the instructor or organization for setting the standards and awarding children who for the most part are not ready to wear the black belt. Just make sure that the next time you or your children decide to take up martial arts to ask the instructor at what age he earned the honor. A 50-year-old instructor that earned his black belt at 7 may not be as capable as a 29-year-old instructor that got his at 24; one of them had to earn it the “hard way”. Pete Kontakos is a blogger that enjoys discussing sports, martial arts, sports supplements and management related topics. He is a husband and father who is also a certified wrestling coach through USA Wrestling. How To Start Learning Mixed Martial Arts (MMA)! Popular Styles of Mixed Martial Arts! Want to Get in Shape? 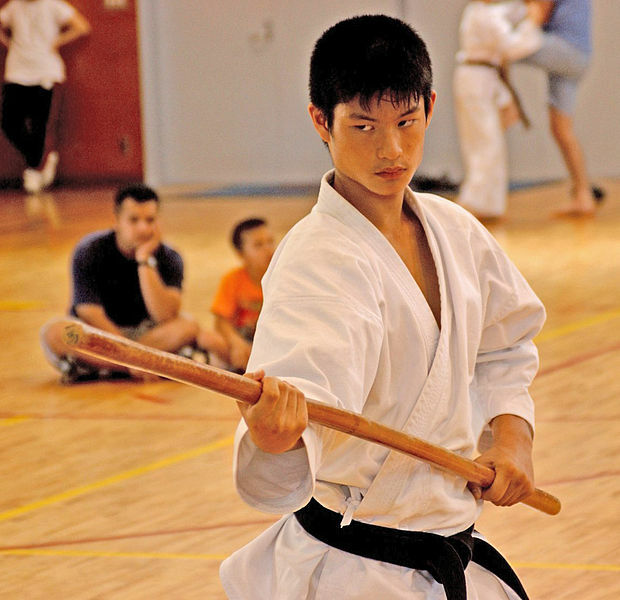 Try One of These Martial Arts! This entry was posted in Other and tagged a "dan" grade, black belt, Bruce Lee, children black belt, childrens activities, Chuck Norris, junior black belt, kids, martial artists, martial arts, Mixed Martial Arts, mixed martial arts blogs, MMA, pros and cons, self-defense, sports and leisure, sports and recreation, Sports Archives, Sports Blogs. Bookmark the permalink.